NEW GITANE "CITY LINK" FRAMESET AVAILABLE FOR A LIMITED TIME IN THE USA! For a limited time, Gitane's "City Link" single speed cross/commuter frameset will be available in select stores in the USA! 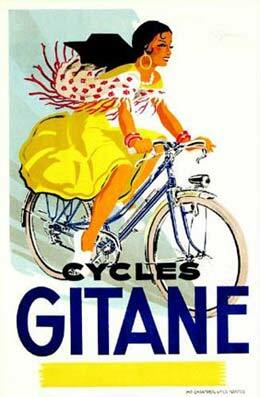 This will be the first time in years any Gitane has been made available to customers in the USA. For only $399, you can own a French Legend! Marcel Bruneliere began the company when he started a mechanics shop in 1925 in Machecoul, France, which specialized in farming machinery parts. As a side business, he began producing parts for bicycles at about the same time. 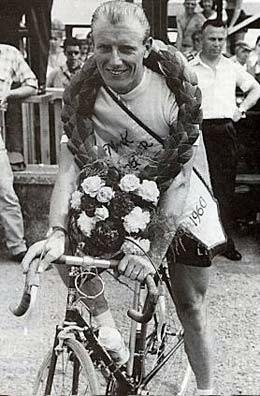 The following year, he opened a bicycle manufacturing shop in some horse stables on Rue des Redoux in Machecoul, which produced two to three bikes a day under the brand name Marbru. 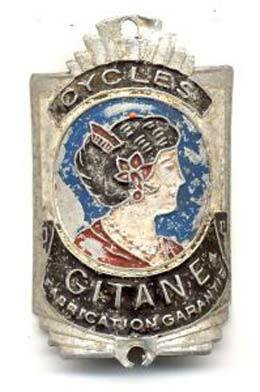 It was in 1930 that Mr. Bruneliere first used the brand name Gitane on bicycles, produced by ten people in the small workshop. However, frame production would not begin until 1940, when the company began producing complete bicycles. 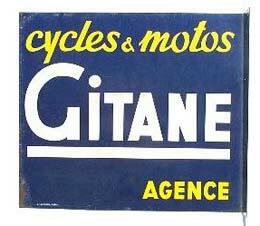 The company was renamed Cycles Gitane in 1952, and began producing motorcycles in addition to bicycles, quickly growing to the number 4 producer of motorcycle engines in France. 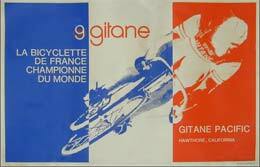 At the time, Cycles Gitane began to sponsor bicycle racing teams as well as motorcycle racing. 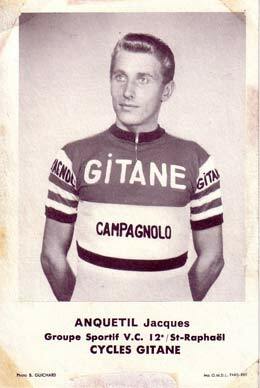 The firm made its first big impact on the professional cycling circuit in 1957, when Jacques Anquetil rode a Gitane to victory in the French National Championships. 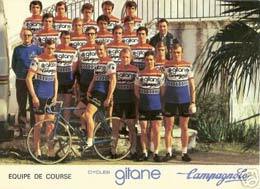 This began a period of prominence for Gitane in bicycle racing which would peak in the early 1960’s, late 1970s/ early 1980s. In 1960, the company name was changed to the Micmo S.A. and was producing around 500 bicycles per day. It also began producing other sporting goods products, none of which appeared to have been very successful. 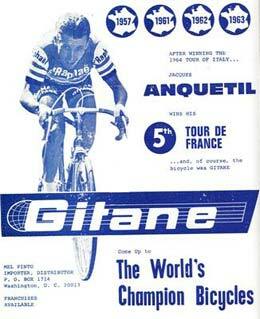 By 1972, Micmo was France’s number one exporter of bicycles, sending over 185,000 overseas per year. The “bicycle boom” in the USA is one of the major reasons, where Micmo’s bicycles, under the brand name “Gitane”, introduce an entire generation to European lightweight racing bicycles at affordable prices. While the company offered a full range of bicycles, the Gitane “Tour de France” was the lightweight leader for the company, featuring frame of Reynolds 531 tubing, and French-manufactured components including Simplex derailleurs, Mafac brakes, Normandy hubs, Pivo stems, and Stronglight headsets, crank sets, and bottom brackets. Flush with success, the Gitane brand name became attractive to larger companies in France – namely the Renault auto group, which purchased a 30% interest in the company in 1974, and then fully annexed it into its Renault Factory Group in 1976. This purchase began the second (and, sadly, the last) “golden era” for Gitane racing – both on bicycles and in motorcycles – with Renault pouring resources into racing teams featuring Gitane products. 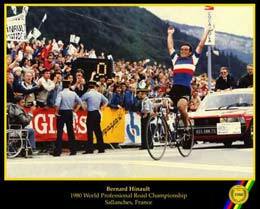 The Renault-Gitane team began dominating the European cycling scene with Bernard Hinault, Laurent Fignon, the Madiot brothers, and would led to the discovery of the first big name in US cycling: Greg LeMond. But despite the success of the Renault-Gitane team, economic realities in the bicycle industry and the end of the bike boom necessitated a retreat from the free-spending days of the 1970s. 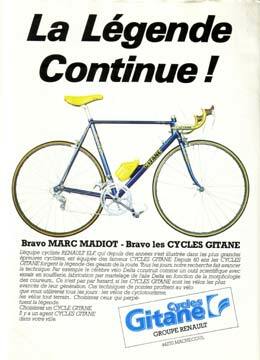 In 1985, amidst a recession in France, Renault reorganized and ditched Micmo-Gitane. Other companies, such as Motobecane and Peugeot were facing similar hardships and it there was even some question as to whether France would be able to maintain a bicycle manufacturing industry at all. 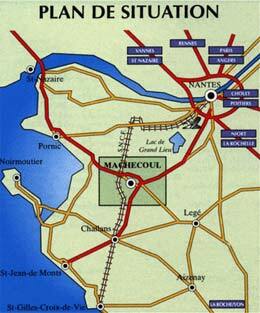 To cut costs and increase productivity, production facilities throughout in several other cities were relocated to a central factory in the Machecoul in 1986, and by 1987, all bicycle manufacturing was under one roof in the city. In the USA, the Gitane distributor went belly-up, making Gitane nearly impossible to find since that time (except for a few occasional buys by high-volume shops such as Bikeology/Supergo). In 1992, Gitane, Peugeot, and B.H. cycles combined to form Cycleurope. The merger instantly created the largest manufacturer of bicycles in Europe. The Micmo-Gitane factory soon began producing bicycles under the brand name Peugeot and even Raleigh (for French markets only) – in addition to Gitane. In 2000, Cycleurope was purchased by a Swedish company, which soon also acquired Bianchi, making it a major force in the worldwide bicycle industry. Cycleurope’s brands also include Crescent, Legnano and Puch. Today, Gitanes are still produced in the factory in Machecoul, but are no longer available in the USA. Only Bianchi is marketed in the USA by Cycleurope, forcing Gitane and Peugeot fans to look elsewhere for their bikes. Today, Machecoul-produced Gitanes are available only in France. Taiwan-made Gitanes are now available in Australia. All material © 2005-2011 by Stephan Andranian. Any unauthorized use is prohibited.